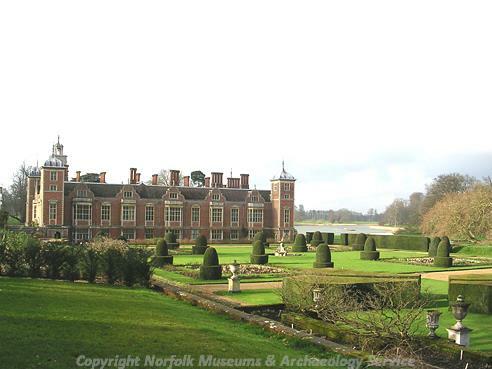 One of the most important Jacobean houses in England, Blickling Hall was built in the early 17th century by Robert Lyminge, within a medieval moat, on the site of a medieval hall. The Hall was built on a double courtyard plan, of red brick, with ogee domes. The interior of the Hall has elaborate fireplaces and plaster ceilings, and formal gardens originally laid out in the early 17th century, with 18th century garden buildings, including a temple and an orangery. 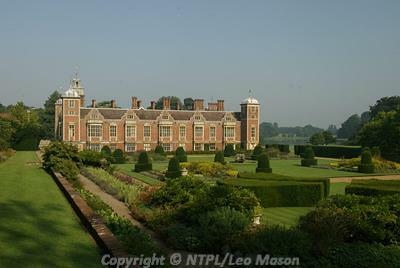 Blickling Hall, one of the most important Jacobean houses in England. Present building replaced a medieval house, built in 1390s, with 16th century additions. Built 1616 to 1627, inside medieval moat, for Sir Henry Hobart, and designed by Robert Lyminge, the architect of Hatfield House. Altered 1765 to 1785 by Thomas and William Ivory of Norwich. Red brick with stone dressings, 4 storeys, originally a double courtyard plan. Doorway in south façade with elaborate entrance and 3 sotrey lantern turret. Elaborate chimney pieces and plaster ceilings in interior, stained glass window in Hall from 16th or 17th century. Formal gardens to east, of various dates. Probably contemporary with the building of the house in the early 17th century. 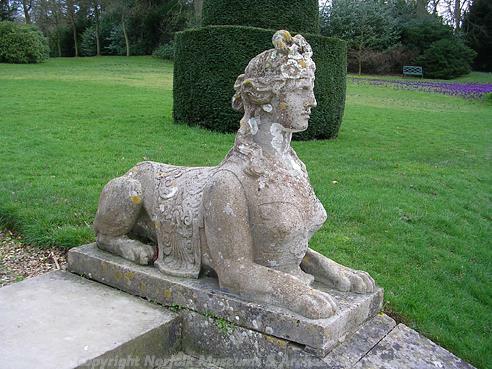 A statue of Hercules, and a fountain are 16th or 17th century, and are from Oxnead Hall. NAU air photography shows a cropmark of a formal garden of about 1900. 1951. Bronze Age macehead found. See (S3) for moulding details. Unique sewerage system of 1890 which draws stream through cellars, see NIAS survey of sewage works on fiche. (S4) describes a rare survival of a 'punishment' room for servants on the roof of the house, with original graffiti. Conservation work following flooding in 2002 led to the rediscovery of a 19th-century arts-and-crafts style ceiling. The extensive gardens at Blickling Hall will be included in a national survey of all plants in the grounds of National Trust properties in order to aid management. H. Hamilton (NLA), 27 May 2008. 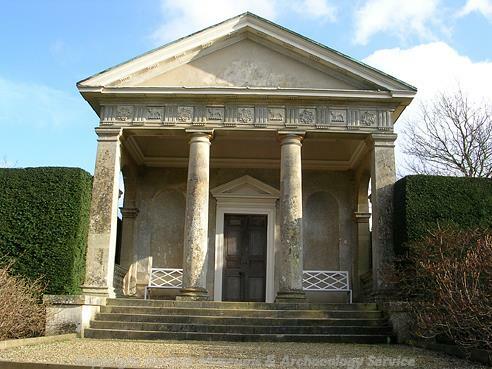 An extensive review of the estate was carried out, to assess the condition of and recommend future conservation works to the whole estate landscape. Previously unknown eighteenth century drainage culvert discovered. Mortlake tapestries restored and rehung in the Upper Ante Room. Human tooth discovered in the attic. H. White (NLA), 29 January 2010. The main staircase and the Brown staircase have been tested in advance of repair work. H. White (NLA), 25 March 2010. For further information about the Boleyns at Blicking, see (S12). A. Cattermole (HES), 20 July 2011. Restoration of the ornate chest from Blickling Hall has been found to be over 400 years older the previously thought and has been reported to have been brought back from Italy probably in 1861. See (S13) for further information. M. Langham-Lopez (HES), 15 February 2013. During World War Two the house was requisitioned and served as the Officers Mess of nearby RAF Oulton (NHER 7364). D. Gurney (HES), 08 March 2013. --- Aerial Photograph: Edwards, D.A. (NLA). 1994. TG1728 A-Z,AC-ABU; TG1828 A - D.
--- Aerial Photograph: Edwards, D.A. (NLA). 1994. TG1828/E, H; TG1728/ACG, ACH. --- Aerial Photograph: Edwards, D.A. (NLA). 1993. TG 1728ACB - ACE. --- Aerial Photograph: Edwards, D.A. (NLA). 1995. TG 1828P - S; TG 1728ABZ, ACA. --- Aerial Photograph: Edwards, D.A. (NLA). 1995. TG 1728ACJ - ACL; TG 1828J - K, M- N.
--- Aerial Photograph: Edwards, D.A. (NLA). 1996. TG 1828Y - Z. --- Aerial Photograph: Edwards, D.A. (NLA). 1996. TG 1828T - X; TG 1728ACP. --- Unpublished Document: 2011. Planning Application. 20111306. --- Unpublished Document: Maddison, Dr.. 1995. Guide to Blickling Estate..
--- Unpublished Document: Maddison, Dr.. 1989. Guide to Blickling Estate. --- Photograph: 1991. Unknown photograph. --- Photograph: 1970. Unknown Photograph, March 9. --- Newspaper Article: 1975. Eastern Daily Press. 1 March. --- Newspaper Article: 1975. Eastern Daily Press. 7 January. --- Newspaper Article: 1976. Eastern Daily Press. 1 September. --- Newspaper Article: 1978. Eastern Daily Press. 20 September. --- Newspaper Article: 1987. Eastern Daily Press. 9 January. --- Newspaper Article: Eastern Daily Press. 1987. Lift to 'open up' historic hall. 27 June. --- Newspaper Article: 1987. Eastern Daily Press. 9 July. --- Newspaper Article: 1989. Lynn News. 19 July. --- Newspaper Article: Eastern Daily Press. 1990. £50,000 battle against book beetle. 20 January. --- Newspaper Article: Eastern Daily Press. 1990. Rare volumes on show in new document room. 14 July. --- Newspaper Article: Eastern Daily Press. 1990. Norfolk HQ of National Trust. 23 October. --- Newspaper Article: Eastern Daily Press. 1992. Gilt edged find puts paintings in frame. 5 February. --- Newspaper Article: 1993. Eastern Daily Press. 2 October. --- Newspaper Article: 1994. Eastern Daily Press. 5 December. --- Newspaper Article: Eastern Daily Press. 1995. Jacobean hall is a place of beauty both inside and out. 10 January. --- Newspaper Article: Eastern Daily Press. 1995. Glorious window back where it belongs. 10 March. --- Newspaper Article: 1996. Eastern Daily Press. 26 September. --- Newspaper Article: 1997. Eastern Daily Press. 13 February. --- Newspaper Article: Eastern Daily Press. 1999. Getting bigger and well worth preserving. 22 January. --- Newspaper Article: 2001. Eastern Daily Press. 27 September. --- Newspaper Article: Eastern Daily Press. 2002. Water damage blow for historic hall. 17 July. --- Newspaper Article: Eastern Daily Press. 2009. Why Historic Hall Has a 30-Something Garden Vision. 9 March. --- Newspaper Article: Eastern Daily Press. 2009. Pupils dig in to help with historic garden project..
--- Newspaper Article: Eastern Daily Press. 2010. New life blossoms in the 'Wilderness' at Blicking.. 5 March. --- Newspaper Article: Eastern Daily Press. 2010. Make your vote count.. 30 September. --- Newspaper Article: Eastern Daily Press. 2010. Norfolk's spooky past. 27 October. --- Article in Serial: 1905. Blickling Hall, Norfolk.. Country Life. 9 December, p1. --- Article in Serial: 1930. Blickling Hall - II.. Country Life. 21 June, p2. --- Article in Serial: 1922. The Stairway - Blickling.. Country Life. 7 January, p1. --- Article in Serial: 1944. Photograph Blickling Hall.. Country Life. 23 June, p1. --- Article in Serial: James Lees-Milne. 1955. Blicking Hall.. Country Life. p15. --- Article in Serial: 1898. Blickling Norfolk.. Country Life. 29 January, p 4. --- Article in Serial: 1910. The Gardens at Blickling, Norfolk.. Country Life. 7 May, P1. --- Article in Serial: 1922. A formal arrangement of Yew hedges at Blickling.. Country Life. 18 February, P1. --- Article in Serial: 1930. 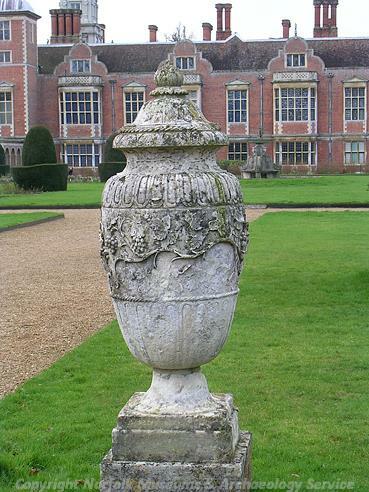 Blickling Hall - I. Norfolk.. Country Life. 7 June, p8. --- Article in Serial: Major, C. S. Jarvis. 1941. A Countryman's notes.. Country Life. 15 February, p1. --- Article in Serial: 1941. Lord Lothian bequeathes Blickling to the National Trust.. Country Life. 22 February, p2. --- Article in Serial: John Cornforth. 1988. Blickling Hall, Norfolk - III.. Country Life. 31 March, p3. --- Article in Serial: 1941. A revival of rural crafts.. Country Life. 22 Februarary, p1. --- Article in Serial: 1950. Blickling Hall, Norfolk.. Country Life.. 23 June, p1. --- Article in Serial: 1960. Massive planting of Azaleads and Yew framing a classical temple at Blickling, Norfolk.. Country Life. 18 February, p1. --- Article in Serial: 1967. The Lake at Blickling Hall in Norfolk.. Country Llife. 2 March, p1. --- Article in Serial: Airs, M. 1980. Blickling Hall. Archaeological Journal. Vol 137 pp 336-341. --- Article in Serial: Sutcliffe, J. H. F. H. 1970. 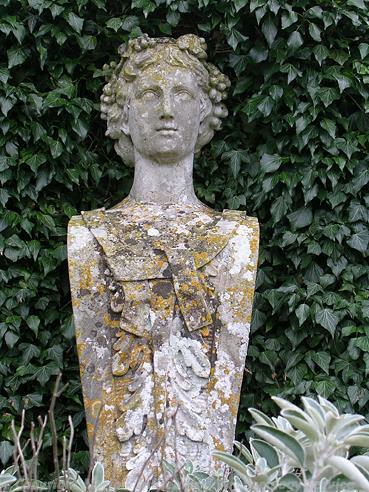 A Statue of Diana at Blickling. Norfolk Archaeology. Vol XXXV Pt I pp 144-145. --- Newspaper Article: Eastern Daily Press. 2013. New champion for region's treasured heritage sites. 18/05/2013. <S1> Serial: Pevsner, N.. 1999. Buildings of England, NE Norfolk and Norwich.. p400-407. <S3> Unpublished Document: Carter, A.. Building Survey. <S4> Newspaper Article: The Times Saturday Review. 1990. 24 November. <S5> Newspaper Article: Eastern Daily Press. 2007. Flood led to rediscovery of hall's hidden treasure.. 20 February. <S6> Newspaper Article: 2008. Eastern Daily Press. 13 May 2008. 13 May 2008. <S7> Unpublished Contractor Report: Penn, K. 2008. 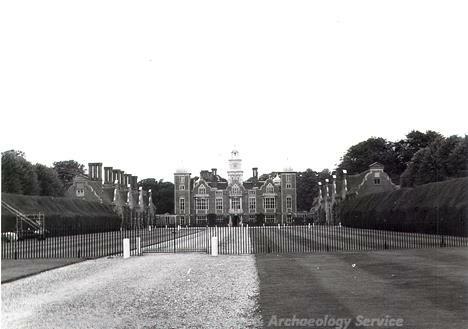 Blickling Estate, An Archaeological and Historical Landscape Survey. NAU Archaeology. 1399. <S8> Newspaper Article: Eastern Daily Press. 2009. Historic Drains Get Cleaned Out.. 4 March. <S9> Newspaper Article: Eastern Daily Press. 2009. Ancient Blickling tapestries back to their former glory.. 8 July. <S10> Newspaper Article: Eastern Daily Press. 2009. Gnash in the attic? Better blame it on the Jaco-bites.. December 29. <S11> Newspaper Article: Eastern Daily Press. 2010. 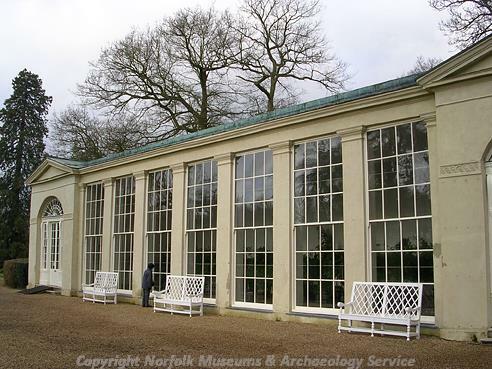 Experts give Blickling's staircase the sandbag test.. 28 January. <S12> Article in Serial: Griffiths, E.. 2009. 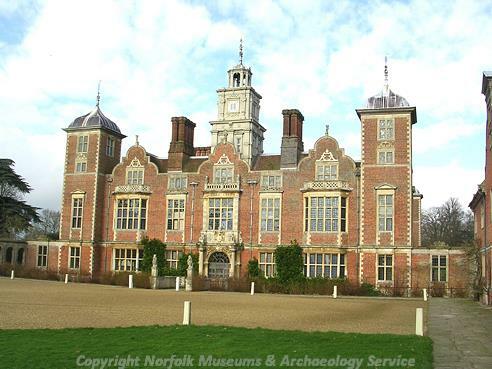 The Boleyns at Blickling, 1450-1560.. Norfolk Archaeology. XLV, part IV, pp 453-68. <S13> Newspaper Article: Eastern Daily Press. 2013. Wedding chest's secrets revealed. 5 February. <S14> Illustration: Edwards, D. A.. 1977. Sketch of Blickling Hall grounds.. Film.